Nancy Perry, Memories, acrylic and mixed media on canvas, 12” x 12"
Nancy Perry has been Painting for many years and gone through many phases. She has participated and won prizes in juried shows and has been invited to show in one-person and small group shows. She has studied with several well-known teachers and at Anderson University and the Greenville Museum. 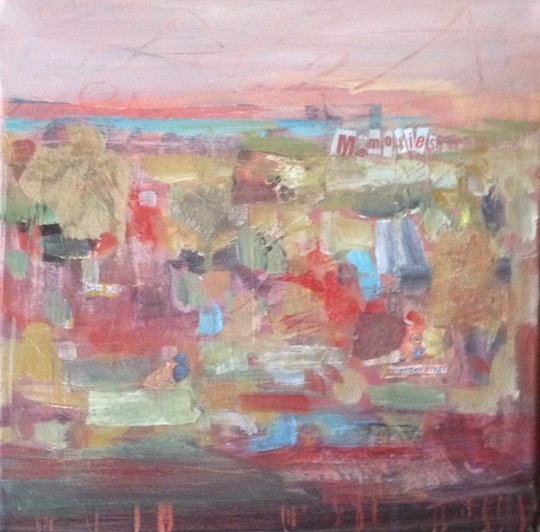 For the past several years she has found freedom in using mixed media to express feelings of special times and places. Her method of working is to start with random marks, colors and textures and layer until a satisfactory outcome is achieved. From chaos to harmony has been her goal. I loved participating in this project. I am always interested in all forms of creativity and in artists working in other areas of the world, so I was especially pleased to get a poem by someone who lives far from me. Projects that interest me are always fun, and I enjoy doing them.